Equipamientos Para Entorno Urbano moving forward with solid steps according to its plan of expansion and consolidation on overseas markets. In this way, the different Eastern Europe countries are a great opportunity, considering their peculiarities and complexities. 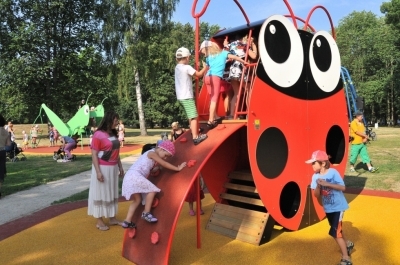 After several months of different commercial actions, Entorno Urbano has achieved the introduction of its Bichos Bugs line in one of most emblematic and important green areas at Ventspils, Latvia, called “Renka Darzs” Renka Garden, close to Ventspils Olympic Center stadium. This location is one of the most visited places by the town’s population and tourists due to its diverse cultural, musical and leisure offer, mainly in the summer. The inauguration ceremony took place on last 6th August with the presence of the Mayor Mr. Aivars Lembergs among other municipal personalities and authorities. We make the most of the occasion to express our gratitude for efforts of all the professionals that have made possible this important achievement.